1 of 5 Heat oven to 425 degrees. Cook lentils in boiling salted water 35 to 40 minutes. 2 of 5 Meanwhile, on a large baking sheet, toss squash with 1 tbsp of the oil, 1/4 tsp of the salt and 1/8 tsp of the pepper. Roast at 425 degrees for 25 minutes, stirring once. 3 of 5 Add 2 tbsp of the oil to a large nonstick skillet and heat over medium to medium-high heat. Add onion; cook 2 minutes. Stir in collard greens, remaining 1/4 tsp salt and 1/8 tsp of the pepper. Cook 8 minutes. Transfer to a large bowl and coat skillet with nonstick cooking spray. Drain lentils. 4 of 5 Add lentils and squash to collard green mixture in bowl. In a small bowl, whisk remaining 2 tbsp oil, the vinegar, mustard, sugar and remaining 1/8 tsp pepper. Toss lentil mixture with dressing, almonds and feta and set aside. 5 of 5 Fry eggs in nonstick skillet coated with nonstick cooking spray to desired doneness (this can be done in multiple batches). 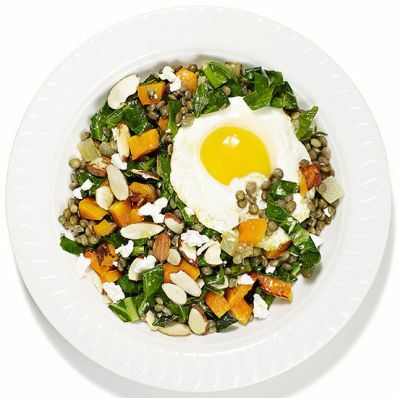 Divide lentil salad among 6 plates or shallow bowls and top each serving with a fried egg. Per Serving: 12 g fiber, 39 g carb., 5 g sat. fat, 193 mg chol., 23 g Fat, total, 427 kcal cal., 626 mg sodium, 20 g pro.